Working in advertising today, at least partially, is about nostalgia. Dreams of making a career in creative ads that the world would be talking about are still around on Madison Avenue, though becoming more of a fantasy in a world that has found and embraced Tivo. Yet the most powerful image of the golden age of advertising remain the characters themselves, who were larger than life. Leo Burnett. David Ogilvy. 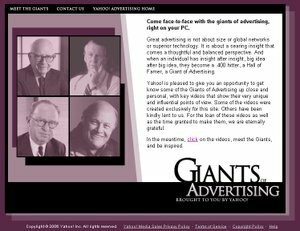 These were the ad men who changed the world of communications, branding, marketing and entertainment with their visions. They created the industry that for years to come would attract some of the most talented and creative people in the world. And just like much of classical music is defined by composers that have been dead many centuries, advertising as an art was defined by these men. Many of the largest agencies in the world still bear their names (including the one I work for). Yet while this nostalgia may be an inspiring thing, it is not a daily event. We all have clients, workloads, demands, and challenges and it’s not easy to think big – or remember that it is innovation that drives our industry. So when I came across Yahoo’s campaign to agencies, using video of some of the legends of our industry talking about their art – I loved the concept. For a vendor to align themselves with the idea of inspiration says many things to today’s agency pros. That Yahoo cares about innovation, that they understand the heritage of the agency, and that they want to help agencies implement those big ideas. In a world where more and more vendors focus on a business model that excludes agencies (sometimes rightly so) – it is still nice to find a pocket of understanding from a vendor. More and more we are seeing others take the cue and realize that working with agencies can often yield better results for everyone. As more vendors follow this lead, we can be sure to see more of these types of activities. And as an agency guy, I welcome them. Not that I don’t love a free beer or tsotchkes as much as the next guy, but my real currency is innovation that lets me do something better for my clients, and the vendors that help me get there are the ones that will win my business.